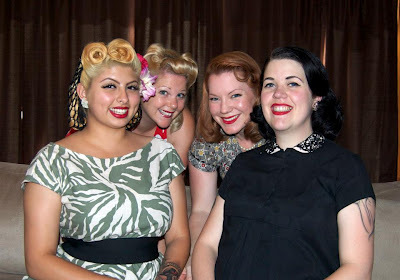 Last month, my vintage ladies’ group, Bon Vivants, held a sewing get together, which I hosted. Melissa of the great vintage lifestyle blog Technicolor Cutie, was the group organizer. You can read her blog entry about the event here. I have a sewing machine, and there was a time that I collected vintage patterns for the artwork. I also hand-sew toys, like this owl. Or this cat. I’ve hand-sewn toys and dolls out of found fabric, vintage buttons, and cast-off sweaters since I was about fifteen. I also learned to crochet when I quit smoking some years ago (to keep my hands busy), and I’m able to knit a basic stitch.